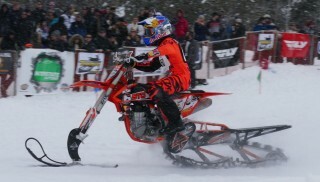 This winter, the American Motorcyclist Association will begin sanctioning the relatively new sport of snow bike racing, which features competition off-road motorcycles modified for snowy terrain. The inaugural series sanctioned by the AMA will be the AMA Championship Snow Bike Series, promoted by Big Nasty Hillclimb LLC, an AMA-chartered promoter out of Boise, Idaho, that has experience promoting hillclimb and hare and hound events. 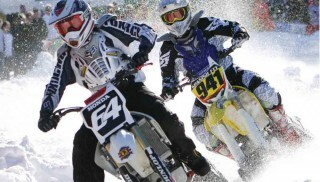 The first round of the AMA Championship Snow Bike Series will be held at ERX Motorpark near Minneapolis, Minn., on Dec. 18. 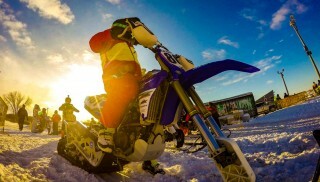 The snow bikes, which swap out wheels and knobby tires for a ski up front for steering and a high-performance snowmobile-style track in the rear for traction, will compete on a motocross-inspired half-mile track of jumps, banks, right and left hand turns, and whoops and dips. Spectator admission is $10 for ages 13 and older, $5 for kids 6-12 and free to those 5 and under. Veterans and active military members will be offered free admission with military identification or if wearing full uniform. Practice begins at 9 a.m., with racing starting at 11 a.m.
For more information about the Dec. 18 event and the AMA Championship Snow Bike Series, contact Ron Dillon at (208) 573-4255, or visit the series’ website.